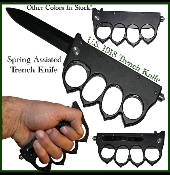 The Trench knife folder series combines the best of spring assisted knives & brass knuckles. The handle sits atop the black steel liners. The liners extend out into nicely contoured spiked knuckle guards which protect the hands and are sturdy enough to use on the offensive. A solid steel skull crusher sits on the handle opposite the blade. The razor sharp blade is 1045 Surgical (tool) steel. Simply touch the back of the blade, and it snaps open and locks in place via the liner locking mechanism. Included is a removable pocket clip for easy transport.